This year marks a decade since the death of the incredible Masanobu Fukuoka (1913-2008), the Japanese farmer and philosopher, most known for his 1975 book The One-Straw Revolution. Fukuoka pioneered the concept of “natural farming” or “do-nothing farming”, a philosophy not only related to farming, but also as a way of life. His work has hugely influenced the organic farming movement and permaculture as we know it today, as well as influencing us here at Just Trees and the way in which the nursery is managed. Fukuoka trained as an agricultural scientist, specializing in plant pathology, however his life’s journey unfolded somewhat differently and he did not spend the remainder of his career in a lab. Through intense observation and constant experimentation, he developed a method of farming his land without cultivating the land (no tilling or plowing of the soil), without the use of fertilizers or pesticides and with minimal weeding and pruning. The fascinating part is that his yield surpassed some of the most productive farms in Japan! 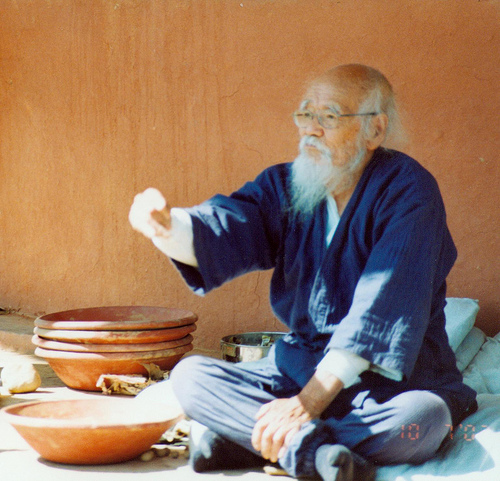 Fukuoka travelled extensively in his lifetime, giving talks and lectures on his constantly-evolving natural farming discoveries, publishing texts and revealing truths not only regarding the potentials of natural farming and permaculture, but also the perils of monoculture and industrial farming. However, his revolutionary work in farming techniques extends into a deeper philosophy that calls for individuals to re-examine their relationship to nature, something that today urgently needs to happen on a national and global level. In the meantime, we highly recommend that you check out this treasure of a book and the philosophy of Masanobu Fukuoka.